JW Barham was diagnosed with terminal lung cancer that has spread to the adrenals in June 2008. He was asked to undergo chemotherapy and radiotherapy. With the treatment he would have 12 months to live but without treatment it would be 6 months. JW refused further medical treatment and opted for CA Care Therapy. After six months, JW found himself six feet above ground, climbing a ladder to paint his new home. No, he was not six feet underground yet. We have requested Seng, the son of one of our patients in Malaysia, to talk with JW in Hawaii and made this video recording. Mahalo … many thanks … to all of you for your efforts and contribution. I do not want my face blanked out because I want the whole world to know about Dr. Chris’ treatment. About 8 or 9 months ago (i.e. July 2008), I found out that I was given a death sentence. I had lung cancer. And it had metastasized to the adrenals. I went to 2 or 3 second opinions and stuff like that. They all confirmed with the films, PET scan and CAT scan that indeed I did have a tumour in my right lung and that it had metastasized to the adrenals. They tried to get a biopsy through my throat to go into the lungs, but I kept coughing out the camera. So they sent me back the next day, they went in through my back with a needle. They got the sample, I guess, and they said, yup it was malignant. Dr. Gelb: It was the worst. No surgery applicable. JW: It was terminal. They said I got about 6 months to live. Fast growing, fast spreading, and they tried to talk to me into chemotherapy and radiation. For … most people, not all – the response to chemotherapy and radiation you’re sick, you lose your energy, your body just tends to shut down. I was just not going to go through that. Because, if they said I might have a 50-50 chance of survival, I may have tried it. But they said: No. If I did chemotherapy and radiation, they could probably extend it from six months to a year. JW Barham, a 79-year-old (in 2008) Caucasian gentleman, was an active smoker (one packet a day for 60 years) and had a history of coronary artery disease (has a stent), hypertension, hyperlipidemia and chronic renal insufficiency. In addition, JW had undergone a craniotomy and resection in February 1996 for meningioma. He also had laryngeal polyp and diverticulosis. He has prediabetes mellitus. 1. Combivent – inhaler, to prevent spasms of the airway or bronchus caused by chronic obstructive pulmonary disease (COPD). 2. Prilosec (omeprazole) – to decrease the amount of acid produced in the stomach. JW has long history of acid reflux. 4. Lisinopril – to treat hypertension, congestive heart failure and to improve survival after a heart attack. 5. Zetia – to treat high cholesterol. 6. Atenolol – to treat angina (chest pain) and high blood pressure. 7. Aspirin – used in long-term, low doses to prevent heart attacks, strokes, and blood clotformation in people at high risk for developing blood clots. 8. Plavix – to help protect against future heart attack or stroke. 9. Cynocobalamin – a vitamin B12. 10. Colace – a stool softener, makes bowel movements softer and easier to pass. 11. Lactulose – for constipation. 1. There is 2.7 cm right hilar mass suspicious for malignancy. 2. 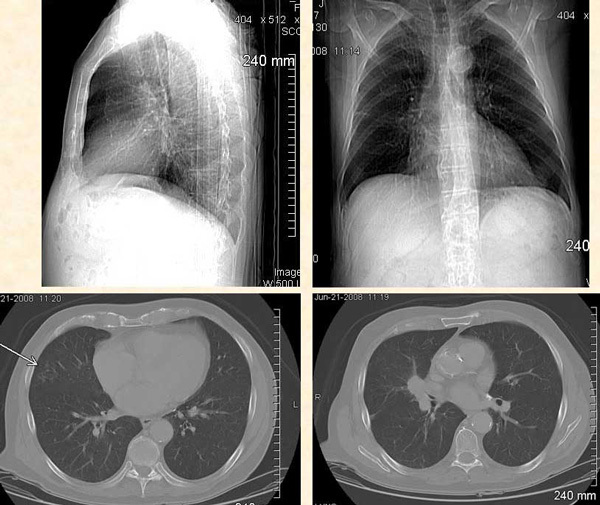 Probable post-obstructive pneumonitis of the right middle lobe. 3. There is a new 2.7 cm right adrenal mass consistent with metastasis. 4. Stable fibrosis at the lung apices. 1. Hypermetabolic right hilar mass is highly worrisome for malignancy. 2. Mildly hypermetabolic hilar and subcarinal lymph nodes still worrisome for lymph node metastasis. 3. Markedly hypermetabolic right renal mass. JW: Dr. Suzanne Gelb was kind enough to do some googling. She found Dr. Chris on her computer. We e-mailed him. Sure enough, after reading some testimonials, and we … got some of his books:Food and Cancer and all of that. And it just made a lot of sense. Dr. Gelb asked if I would like to try that. I said why not. I don’t have anything to lose. So we got hold of Dr. Chris. I sent him my diagnosis, I sent him all of my medical records. He designed my treatment based on my condition. Question by Seng: Dr. Teo’s treatment – I heard it has to do with your lifestyle, your diet, exercise and herbs. Can you explain? JW: I had to change my whole life. I had to change my diet to that of a vegetarian. Raw food vegetarian and lightly steamed vegetables occasionally. And grains. Everything that Dr. Teo recommended. I had to drink the teas he recommended. In the beginning, there were 5 – 6 teas and right now, I am drinking 4 teas. They are all prepared and designed for my particular treatment. You know, I was born and raised on a farm. I grew up on a farm. I was a carnivore – on meat and potatoes diet. I can understand that 70% of the people just can’t deal with the diet or deal with the tea. I didn’t mind the tea. Q: Was the tea bitter? JW: No. It’s not bitter. It just tastes different. It’s no different than coffee. It has its own flavor, its own texture. I strain and get the grounds out of it and I shake it up and drink it. I didn’t mind the tea. What got me was the raw food. Nothing is seasoned, it had no taste. Did you ever eat a steamed potato without any butter and sour cream and gravy? With Dr. Gelb’s help – she said, “Eventually you will acquire the taste for it, just hang in there.” And with her coaching, I stayed away from all other food. She would get me a raw broccoli. Well I used to take broccoli as an appetizer or something, but you dip it in ranch dressing or something, you know, and raw cauliflower and celery – but you dip them in all this junk, and it camouflages the real flavor and texture. It took about 2 months when I really began to identify the flavors in every fruit and every vegetable. And now, 8 months later, I am enjoying it. For supper last night, I had an avocado, some lightly steamed broccoli and lightly steamed onions and a raw tomato. Then I had ground sesame seeds and flax seeds. [Before] I couldn’t deal with it – like eating cow food, so bland. But now, it has a nice flavor. Now, I drink 8 oz of orange juice, 8 oz of apple juice and 8 oz of pear juice a day when in season, and when in season, grape. And everything has to be organic. Anything that we see on television or read about – I don’t take anything unless Dr. Chris says okay. I would hear that this is good, and I hear that this is good. I would e-mail him and say: Should I take this? He said, No. This is what is would do for you. This is what it won’t do for you. Dr. Gelb: Like he was thinking of getting “retested” to see what’s going on. JW: Dr. Chris said: Go by how you feel. Why get a test to tell you. Why get yourself exposed to all the radiation. JW: It was during the first 10 days, I think. Dr. Chris told me: you are experiencing a healing crisis.Ooh! After the 5th day, I got sick as a dog. I thought I was dying. I thought the tea was killing me. I thought to myself: well, I might just as well go ahead and die. I was sick. I couldn’t get out of bed. Q: Before taking Dr. Teo’s medicine, how were you feeling compared to now? JW: I was feeling lousy…I wanted my body back. I was on a lot of heart medications….I had a stent to my heart. I couldn’t even walk across the street. My legs would ache and I had chronic fatigue, vertigo, lethargic. I had a little scooter that I rode around. And I went shopping on my little scooter because I couldn’t walk…I was on 7 or 8 [medications]…Blood thinners, aspirin, blood pressure medication, cholesterol reducing [medication]– I don’t know. It just kept me sick. And when they diagnosed me [with cancer], I quit it all. I hadn’t had even an aspirin for eight months. I can walk half a mile now. I can run. I can climb ladders and paint [the house]. I got my life back. The only thing that I feel now is I don’t think I have my strength in my body back totally. Because, I don’t know, I feel like my vertigo – I feel my balance sometimes is a little off. But other than that – and we exercise 30 – 35 minutes every day. You’ll see on one of the tapes – we went through the exercise.  Platelets are high (she said that’s due to infection…the cancer).  Cholesterol is high (it was lower when she put me on cholesterol medication which I stopped in July 08).  She said I should take B12 vitamin for low B-12 (she believes all vegetarians should take B12 vitamins).  She said my kidneys are working fine (which was not the case pre-cancer diagnosis in July 08).  She listened to my chest, said my lungs basically sounded good, but she could hear a rattle.  Dr. X didn’t make any recommendations, except for B12. She knows that since my cancer diagnosis I have declined conventional treatment, and that I’m under your care. I told her I’d be e-mailing the blood test result to you, and I would follow your guidance about what to do next.  Dr. X was impressed with how good I feel and look, that I can walk several city blocks (couldn’t do that before) and that I exercise 30 minutes a day, that my arthritis/leg cramps/vertigo have gone away, that my arm/leg/torso muscles have strengthened, and that I haven’t taken a nitroglycerin pill since I’ve been on your teas/diet. I told her that I’m doing pretty good for a dead person!! (On June 23, 08, they told me I’d be dead in 6 months if I didn’t do chemo, etc). Great news about my kidneys! Some time ago, Dr. X said I may need dialysis. I credit your kidney tea, which I’ve been on since Aug 08, for the improvement. As far as my health, I haven’t felt this good in over 10 years. Seven months ago, I couldn’t walk across the street without my legs aching and being exhausted. Since I’ve been on Dr. Chris’s herbal treatment and recommended diet/lifestyle, I have my legs back and can walk ½ mile. I go to the gym 30 minutes daily and my physical strength has improved greatly. 29 Aug 08, JW wrote: Since I started eating according to the Food & Cancer book (July 28) I’ve lost weight quite rapidly (weighed 180 lbs. on July 28, now 164 lbs.). I don’t mind the weight loss because my body feels better, and I’m OK with reducing my weight to 150 lbs. 10 Oct 08: I am still losing weight …I weigh 148 …I can go down to 140. If I go lower, I think that would be too thin … Should I try to gain weight or maintain my current weight? Exercise 30 to 35 minutes daily (stationary bike, weight machines, stretch etc) – haven’t been overdoing it, but I am getting stronger. On 13 Dec 08, JW wrote: I’m feeling great. Recently I walked 4 city blocks and back – first time I’ve walked that far in 5 years! Even though I have a lot of energy and feel so much better than before taking the herbs, I fatigue easily (that’s nothing new). I am able to take naps, after which I feel fine. Also, if I get up too fast from the bed or chair, sometimes I get dizzy for a few seconds (that’s nothing new). In his 16 March, 09 email, JW wrote: To reiterate, 7.5 months ago I quit all my heart medication (blood thinners, cholesterol)…I still carry my nitroglycerin in my pocket, but except of one incident, I haven’t had any heaviness in my chest or chest pains. And to me, my stamina is unbelievable – as you know, before I couldn’t walk across the street without my legs hurting and total fatigue setting in. Now I can walk ½ mile, and I’ve been painting and climbing up and down ladders all day long as we remodel our house. And my colleague, [Dr. Gelb], whom I wrote about in my healing crisis story, can’t believe the stamina I now have. Since a young age, I have had heartburn/acid reflux. My mother gave me baking soda for this when I was a child. After that, I took antacids for this problem for many years (in the U.S., the antacid called Tums is popular). In recent years, my physician prescribed Prolisec for the problem – that’s an antacid which can now be bought “over the counter” (prescription not needed). I started taking baking soda regularly since I started your Food & Cancer book diet on July 28, 2008. At that time, I stopped taking Prolisec because I didn’t want to put toxic medications into my body, and I remembered that my mother gave me the baking soda when I was young. I then did some internet research on baking soda and learned that it is used for heartburn. We felt we could do something for JW about his acid reflux. Pharmaceutical drug is only about relieving symptoms. He can go on taking Prolisec for years but the problem does not go away. One way to solve this problem is to strengthen his stomach. So I took time to research the problem and formulate some herbs for JW. This is what happened after JW took the herbs for his acid reflux. 16 January 09: Acid Reflux: It’s about 90% gone. Some days I don’t take any baking soda; other days I put some on the tip of my tongue 1 x/day, sometimes 2 x/day. Since the problem isn’t completely gone … would it be good to try Stomach 2 which helped your other patient with reflux? 17 March 09: Acid Reflux: Other than having one bad day on March 14th (nauseous, no energy, not hungry – didn’t eat much all day – not sure what caused the bad day), my stomach has felt much calmer – I have gone two days without any heartburn (i.e., didn’t take any soda). Prior to that, I was taking some soda on the tip of my tongue with a sip of water 1 – 2 x/day. Today, it’s 8.26 pm, I haven’t had any soda, my stomach feels very settled/quiet, no indigestion, no diarrhea, much less gas (e.g., passing wind, belching). 7 April 09: Acid Reflux: If I can make it another 3 hours today (till midnight), this will be 8 consecutive days without soda! I am certainly pleased with that. Thank you. After 6 months have passed, I did not wish to remind JW about his problem. But JW telling me that to go by his doctor’s definition, he is supposed to be a living dead. So, I posed some questions for JW to answer. 1) How did you feel after being told that you have only 6 months? I was not surprised, given the diagnosis. Having worked with the terminally ill for years in my capacity as a minister, I was familiar with the diagnosis-prognosis of terminal cancer. I don’t even think that my blood pressure increased when the doctor told me the bad news. The first thing that went through my mind was – No chemo, no radiation. Other thoughts that crossed my mind: I am almost 80 years old, I’ve had a good life, I have no fear of death. I know where I’m going after I lose my body. [Of course we have a natural fear of dying because the survival drive in the body wants to fight for life. But death itself doesn’t concern me]. Another thought that went through my mind was, I’m not going to suffer with this. So, whatever it takes to keep me pain-free as long as my body lives, is the direction I want to take. 2) Then you decided to embark on something that you don’t know about or were not sure of — unproven remedy so to say —- what make you jump over the cliff and decided to ignore modern medicine? As I said above, I didn’t want chemo or radiation. In my work with terminally ill people I‘d seen the pain and suffering that those treatment approaches caused. So when my colleague, Dr. Suzanne Gelb, found your website and brought it to my attention, after I heard your name and saw your picture on the web, I had a deep feeling that you would keep me pain-free as long as God wanted my body to live. 3) Now that you have passed the 6 month mark — how do you feel? I can truly say that I haven’t felt this good in over 10 years. I think that’s around the time that I was put on all the heart medication, cholesterol lowering medication, and whatever else they tried to put in a bottle for me. I felt sick, lethargic, low energy, vertigo. I just didn’t feel well. I was gaining weight (overeating), smoking more than usual. I just didn’t feel good. But now, I feel so much better. I’ve lost about 60 pounds since I started the diet recommended in your Food & Cancer book, I’m able to exercise 30 minutes daily, and walk several city blocks a day (something I haven’t been able to do for years because I had no energy, no strength). However, I still don’t feel well – I don’t know how to describe it. I don’t feel sick, but I don’t feel healthy, if that makes any sense. Perhaps I’m trying to recapture the quality of life I had when I was in my 30s and 40s when I was a ball of energy. Sometimes I forget that next month I turn 80, or, should that even matter if one truly lives a healthy lifestyle? One thing’s for sure, I enjoy life, and emotionally, psychologically and spiritually, I’m in a good place — I don’t feel stressed or anxious about my daily life; I don’t feel anxious or worried about my health – in fact, I feel excited when I think about the improvement I’m experiencing since I’ve been in your hands, and I mean that literally – in your hands (ha, ha – not to hold you responsible if I should die tomorrow!!). When I walked in Dr. W’s office today, her eyes were as big as saucers. She was so surprised to see me, let alone how healthy I looked. My temperature was 98.3, I weighed in at 136.5 lbs, my blood pressure was 126/64, my pulse was 73. I said to her, “You thought I would be dead by now.” She said, “Yes, I’m surprised that you’ve lived this long. Whatever you’re doing, keep doing it.” (It’s about a year since they diagnosed me with terminal cancer, and gave me 6 months to live if I did no treatment, and 1 yr if I did chemo). She said my lungs sounded clear and clean. Today we’re celebrating my one year anniversary since starting the CA Care program July 28,2009. I appreciate all your help and will continue to stay on the program strictly.